Started to do a new theme & lost interest after opening several tabs. That’s the drawback of tabs, isn’t it? All that instant gratification is perfect for my attention span deficit, but by the time I actually click over I’m on to something else. This also may have something to do with the fact that I’m so sleepy I can barely see straight. And yet. 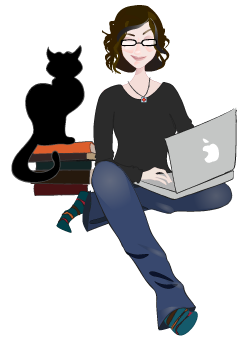 I did get Step 1 of the Great Blog Revamp finished, in the form of an illustration I actually like. Lookit, it’s me! Only, you know, illustrated, with Anime eyes and slightly better hair. (Aside: We took a “vacation” to Bellingham last weekend, or possibly the weekend before, and my hair looked like crap the entire trip. A sign? I say it was.) Oh, and I guess if I’m going for accuracy I ought to have a hole in the toe of one of my socks, because apparently I have a sock problem. And no, I don’t want to talk about it. So I have this great illustration and a brain full of…well, mush is a good word, and a kid (have I mentioned the kid?) who is somewhat less willing to sit quietly while mommy works than one might expect, at least not after mommy has already spent the day working on things that actually pay, in theory. I have ideas, though. Most of which seem to involve bending WordPress to my will and forcing it to dress up like a pimptastic version of Tumblr (or maybe Swurl – Swurl does all sorts of thrilling things with file types, which would fill me with joy if only I could customize it a little more)(and by “a little more” I obviously mean “rip its guts out and tie them into pretty bows and then reattach them in an entirely different configuration,” and if you aren’t craving some Burton* right now, I clearly haven’t done my job). But I do have ideas, and that’s something. I also have dark chocolate gelato. So if you’ll excuse me. *And I still haven’t seen Sweeney Todd, can you believe it? I mean ever, not just the Tim Burton version, which is obviously superior to all other versions, because hello, Tim Burton? Next Next post: one toddler. price: cheap.